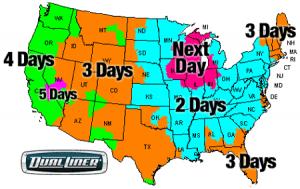 Here are some of the most asked questions about DualLiner truck bedliners. If you still have questions or concerns after reading these, please contact us and we will be happy to help. Q: Does Water Collect Underneath The Bedliner? A: No. Your truck bed came from the factory with a carefully designed drainage system that keeps standing water from collecting on the bed and, most importantly, the paint. The underside of the DualLiner ZeroSkid® rubber floor features raised rubber bumps that work with your truck’s factory drainage system to facilitate water flow to the drain holes and keep it from getting trapped. Q: What is the DualLiner Warranty? A: Simply stated, the DualLiner warranty covers your bedliner from fading, cracking or any other defect for the lifetime of your vehicle. The warranty is fully transferable, as well. It’s the best warranty of any bedliner. Want to learn more? Read the warranty coverage specifics. Q: Will the DualLiner Scuff or Scratch My Truck Bed’s Paint? A: DualLiner is designed to protect your truck from dents, impact and scratches by keeping your cargo in place. Our unique 5 piece design eliminates the heavy shifting back and forth that was common with a traditional one-piece bedliner. By using individual panels and eliminating the constant tugging back and forth, we reduced the chaffing of the plastic against the trucks paint. However, the DualLiner is a polyethylene based product and although our panels are designed with air cushion there are spots where it is necessary to touch the paint for proper protection. In these areas it is possible to see small areas of contact over time. Our goal in designing and producing the DualLiner bedliner is to provide the best in class bed and cargo protection. With the custom-fit panels providing dent protection and the heavy-duty rubber floor providing cargo protection, this is one more reason DualLiner is Simply a Better Bedliner. Q: Will I Need to Drill Into My Truck to Install a Bedliner? A: The load guard and sidewalls are held in place by existing factory cleats and push-in automotive fasteners that do not require drilling. The tailgate protector is held in place by the existing factory bolts and/or screws, push-in automotive fasteners and, on some models, dual-sided tape. On some models, we suggest drilling a quarter-inch hole for added fasteners to the tailgate. To prevent rust, professional rust inhibitor is included. Q: Can It Be Used With Tonneau Covers or Truck Caps? A: Yes. DualLiner bed liners are under-the-rail type bedliners and work with most truck accessories. We have also cut slots into the top (out of view) to allow for the use of clamps. Most caps and tonneau covers can be placed over the bulkhead piece without an issue. If a better fit is desired, the lip can be modified without voiding your Real Lifetime DualLiner Warranty. Please feel free to contact us at customerservice@dualliner.com. Q: Should I Be Concerned With Static Charges Around Gasoline Cans? A: As a general rule, you should always be concerned about static build-up when filling a gas can, which is why most gas stations recommend filling gas cans on the ground. The rubber floor of the DualLiner acts as an insulator and will not carry a static charge, like other bedliners. Also, the DualLiner will help prevent the dangerous situation of gas cans sliding around and generating a static charge during transit, unlike other brands of bedliners. Q: Will the Plastic Components of DualLiner Fade or Chalk Over Time? A: No. UVA and UVB radiation from the sun will not fade the DualLiner’s plastic parts or make them look “chalky.” We use a UVA/UVB resistant treatment with our plastic sidewalls, load guards and tailgate protectors to ensure your liner stays black for the lifetime of your vehicle. This is why we guarantee your DualLiner bedliner’s plastic parts will not fade in our lifetime warranty. Q: Is the Floor Skid Resistant? A: Yes. The rubber floor is a ZeroSkid® surface that no other bedliner can come close to matching. The ZeroSkid® floor also helps provide better dent protection than any other bedliner. A: It typically takes 30 minutes or less to install the DualLiner bed liner. Some customers even say they have installed it in fewer than 15 minutes. A: Your order confirmation email will contain tracking information. You can also contact DualLiner customer support via phone, chat or email. Transit times for FedEx ground orders are displayed on the map at the right. Q: Why Did You Ask If My Truck Has a Factory Tailgate Step? A: Trucks built with a tailgate step come standard from the truck manufacturer with a molded plastic tailgate protector. Selecting the “yes” option means we will not unnecessarily ship you a tailgate protector, saving you $10. If you select “no,” your order will ship with a tailgate protector at the standard price. Any other questions? Call us at (800) 992-1949. Or visit our DualLiner features page, bedliner comparison page or bedliner installation page. You can also buy now online and receive free shipping.